In today’s article we consider 5 potential surprises for 2016 that challenge market consensus views. These strike us as being plausible scenarios which are worthy of consideration when planning for 2016 and beyond. If January is any indication, 2016 is not going to be a boring year for energy markets. Other businesses may boom this year like Water, Food and Other businesses offering good services like catering or massages at TranquilMe. So far this year European spot gas prices have slumped towards 4 $/mmbtu, a 30% decline from Q4 last year. German year-ahead power prices have fallen 20% over the last two months. Brent and WTI crude prices have started the year by converging and crashing below 30 $/bbl, before recovering some ground last week. It is not difficult to be bearish in an environment like this. Over the last two years, we have published a number of bearish articles on commodity prices, with a particular focus on weak fundamentals in the global gas market. Being bearish was a lonely argument in early 2014. But now in 2016 we are hard pressed to find anyone with a positive outlook. The oil market appears to be fixated on a pronounced state of near term oversupply. Global production has remained stubbornly resilient to plunging prices. The inventory overhang continues to build. Hope of a price recovery is focused on an optimistic view that large producers such as Saudi Arabia & Russia will announce coordinated production cuts, despite the fact that it does not appear to be in anyone’s interest to do so. We set out last year why we think the key to oil price recovery is US production. It would not surprise us if sometime in 2016 spot crude prices temporarily fall to levels below the variable cost of US shale producers (e.g. below 20 $/bbl), in order to quell near term oversupply. But it is forward prices that are more important. Falling spot prices have dragged down the whole crude curve below the long run marginal cost of investment in new US shale plays. At the same time, the cost of capital for US producers is ballooning as major debt defaults loom. This environment is likely to be very disruptive for US oil production over the next two years (noting shale oil’s short investment cycle). A ‘clean out’ purge in oil prices in 2016 may mark the start of a recovery into next decade, ultimately to price levels consistent with the long run marginal cost of conventional production. 2015 saw the convergence of Asian and European gas prices, with NBP acting as price support for an oversupplied Asian LNG market. 2016 may be the year when Asian & European gas prices fall to converge with the US Henry Hub. Gas contract prices: Falling oil prices are rapidly flowing through into lower long term oil-indexed gas supply contract prices. Large volumes of LNG supply into Asia and pipeline gas supply into Europe are contracted on an oil-indexed basis. Lower contract prices are set to provide strong overhead resistance for global gas prices as 2016 progresses (in the 5 – 6 $/mmbtu range). LNG oversupply: New liquefaction volumes will continue to ramp up in 2016 (as we have set out previously). This gas is not going to be easily absorbed despite falling prices. As an indication of weakness in demand, Japanese LNG buyers (the world’s largest) are now looking to sell excess volumes previously bought under contract. Asian spot and contract LNG prices have now fallen below 6.00 $/mmbtu, with European hubs currently around 4.50 $/mmbtu (and facing pressure from high storage inventories). Continued downward pressure on European hub prices could see the start of a new phase of Atlantic price convergence (e.g. in a 2 – 4 $/mmbtu range), with Asian prices following closely behind. This may set up the interesting prospect of US LNG exports being temporarily relegated to a ‘peaking supply’ role in the global market. Credit stress may be back in focus in a big way in 2016. The recent collapse in commodity prices hints at a hard landing for the Chinese economy. This increases the chances of sharp currency devaluations in China and other developing Asian economies. Ultimately this should mean a healthier Chinese economy, a key factor behind a sustained recovery in commodity prices. But devaluations may first trigger a major debt default cycle and associated increase in global borrowing costs. Energy markets have some specific credit risks of their own. The slump in oil prices points towards an increasing momentum in US oil company debt default & restructuring. LNG producer margins, particularly for high cost base newer liquefaction projects, are also being painfully eroded by lower gas & oil prices. These events are likely to have broader implications for the cost of capital in the energy industry. But perhaps the most obvious credit risk sits with commodity traders as we set out last year. Falling commodity prices, weakening balance sheets and large & concentrated credit risk exposures may prove to be the undoing of one or more large trading firms. The knock on effect of a major default would likely be felt across the industry as illustrated by the Enron collapse in 2001. So far in 2016 European gas prices are falling faster than coal prices. That means that gas plant competitiveness is increasing, resulting in higher load factors as illustrated in Chart 1. 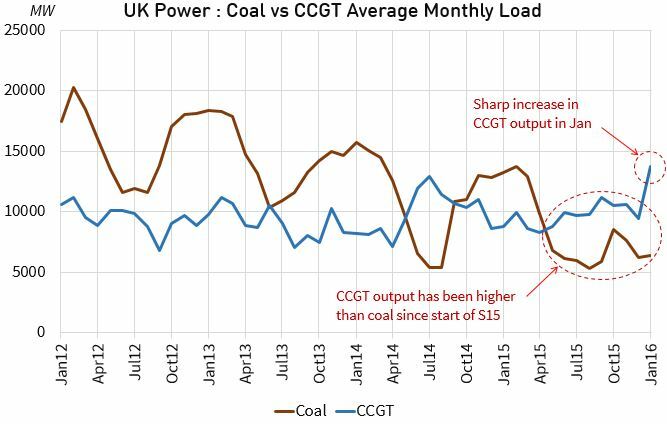 The UK is the canary in the coal mine for recovery in gas plant load factors. This is because the UK’s carbon price support policy penalises the variable cost of coal plants. The surge in CCGT output that can be seen in January 2016 may be just the start of a recovery in gas plant competitiveness across Europe. Falling European gas hub prices have also fuelled sharp increases in the levels of sparks spreads in Continental Europe over the last two months. Year-ahead German spark spreads have increased by almost 5 €/MWh since late last year. Although they are still negative on a baseload basis, newer CCGTs have started to see periods of positive peak margin in 2016. In France, CCGT load factors have seen a substantial increase as a result of lower gas prices. The fate of gas plant competitiveness is closely tied to falling hub price dynamics (set out in 2. above). A continuing decline in European hubs may mean light at the end of the tunnel for CCGT owners in 2016. As for the oil market, a price bottom in Continental power markets may be closer than anticipated. A sharp price slump in 2016 could be the catalyst for a much needed thermal capacity clean out, marking a turning point after a long grind lower. Germany is key to the evolution of Continental power markets. Germany sits at the centre of the European power market, exerting a strong price influence on its neighbours. German year-ahead power prices held up around the 30 €/MWh level across 2015, despite weakening coal prices and rising renewable output. But Chart 2 illustrates the breakdown in German year-ahead prices since the start of this year. This slump has dragged down power prices across North-West Europe. It has also crushed margins on coal plants. At current power price levels, thermal generation in Continental markets is essentially unprofitable. Generators have already endured financial pain on CCGTs for several years. But the latest price declines mean that coal and now even lignite plants cannot cover costs. Less efficient coal capacity is now particularly vulnerable to closure given plunging generation margins (dark spreads) and looming emissions constraints. These conditions may at last induce an erosion of the capacity overhang that has supressed Continental power markets this decade. We are fairly confident of one thing. 2016 will not be a dull year. Article written by David Stokes & Olly Spinks.